The Satmission Live Now™ IP Vehicle Kit turns a car or other motor vehicle into a cost-effective mobile live broadcast production unit. This means that even smaller events may be broadcasted on a tight budget. 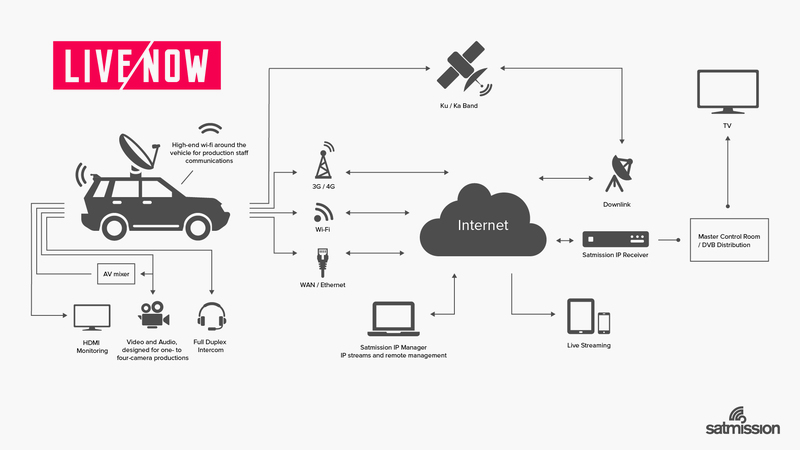 Designed to be super-reliable and simple to use, the IP Vehicle Kit enables high-quality video and audio streaming using whatever IP network infrastructure is available, including satellite Ka and Ku bands. The IP Vehicle Kit supports adaptive bitrate and network bonding between 3G, 4G, Wi-Fi, LAN/WAN and Internet via satellite. The IP transmission and up-link equipment is powered by a 12V battery or 220 VAC. As an optional add-on, an optical fiber connection enables the Live Now™ IP Vehicle to connect to an on-site control room as part of a large-scale live production such as a political or major sporting event. Our focus is to offer you the most reliable Internet up-link system on the market, that is easy to setup. Enable 1-4 camera productions with full-featured AV-mixing and Internet streaming; the Expedition kit configuration also includes a Live Now™ Router capable of receiving live footage from cameras broadcasting via mobile backpack solutions.